Regular Price $39.90, Closeout Price $18.00. Special Pricing available for embroidery see flyer below. This product is the same quality item as the popular women's 121403 microfleece that we have had on sale. 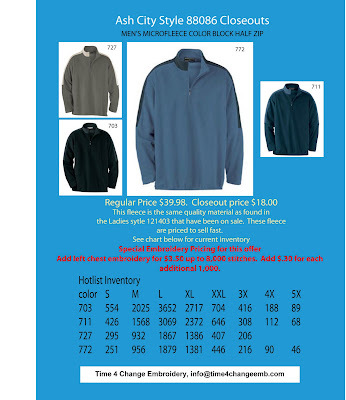 See flyer below for colors and available inventory. These products are priced to move. Click on image to view a larger version. Please call or e-mail if you have any questions.